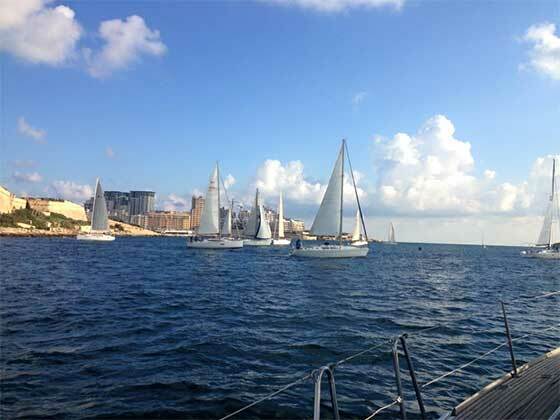 A 21 strong armada of Vikings set sail from Marsamxett Harbour on Saturday morning. Their course - Sail round Gozo and back with just three people on board. The North Easterly conditions favoured the fleet with their spinnakers set from the Sliema front all the way to Dwejra in Gozo. Once the fleet passed Dwejra, they just about crawled their way round to Xlendi where a fresh breeze filled in again all the way to Torri L'Abjad in Mellieha and on towards the finish line. The fleet included various boats or different sizes and ratings which was a welcome change and with other events being planned by the Vikings Sailing Club, we expect to see this fleet to grow even stronger whilst also attracting the local Sunday sailors. After provisional results were issued, in the IRC class, the new XP-44 was the fastest off the blocks and kept the lead all the way to the finish line over Elusive. However, it was the latter that claimed first in IRC on corrected time followed in second place by Xpresso in second place with Lightening finishing off in third place. In the VSC Cruiser class, Escape claimed line honours and corrected time victory over L'Una in second place and Four Winds finishing off in third place. The prize giving ceremony will be held "Il-Barri Bar" in Mgarr on Thursday 19th at 7.30pm with Emirates Airlines and Guze' Brasserie offering the prizes to the winners.